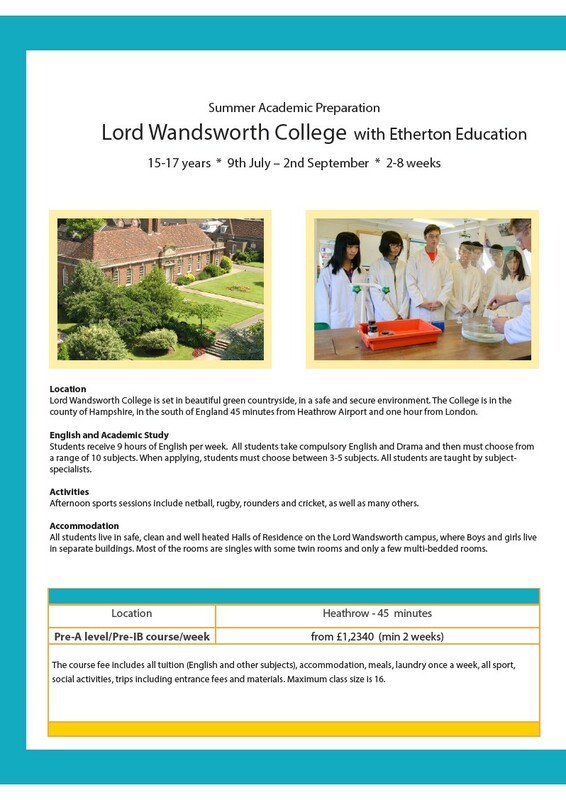 Summer Academic Preparation 12 Lord Wandsworth College with Etherton Education 15-17 years * 9th July – 2nd September * 2-8 weeks Location Lord Wandsworth College is set in beautiful green countryside, in a safe and secure environment. The College is in the county of Hampshire, in the south of England 45 minutes from Heathrow Airport and one hour from London. English and Academic Study Students receive 9 hours of English per week. All students take compulsory English and Drama and then must choose from a range of 10 subjects. When applying, students must choose between 3-5 subjects. All students are taught by subject-specialists. Activities Afternoon sports sessions include netball, rugby, rounders and cricket, as well as many others. Accommodation All students live in safe, clean and well heated Halls of Residence on the Lord Wandsworth campus, where Boys and girls live in separate buildings. Most of the rooms are singles with some twin rooms and only a few multi-bedded rooms. Location Heathrow - 45 minutes Pre-A level/Pre-IB course/week from £1,2340 (min 2 weeks) The course fee includes all tuition (English and other subjects), accommodation, meals, laundry once a week, all sport, social activities, trips including entrance fees and materials. Maximum class size is 16.